The chalice, or cup, is not without certain meaning in the realm of the spiritual. Often, it is a sort of bridge between thought and action, essentially, the emotion, the desire, and the spirit. This makes a Wiccan chalice all the more symbolic to its owner, and it can serve as a fine decoration, a powerful symbol, and a great focus for Wicca rituals. 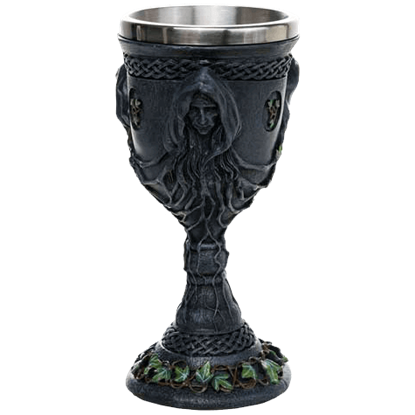 We offer a number of fine chalices to choose from so that a witch or Wicca practitioner can choose the chalice that suits their tastes and their need perfectly. Some of our chalices are designed purely for ritual use, and, being made from resin materials, are not designed to be used for drinking. 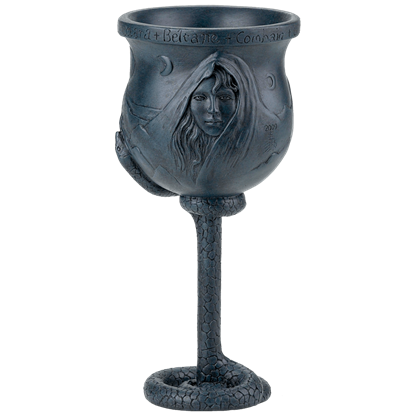 Others of our great Wicca and fantasy chalices are made from drink safe materials or feature steel insets that allow the cups to serve as both ritual items and functional drinking cups both. 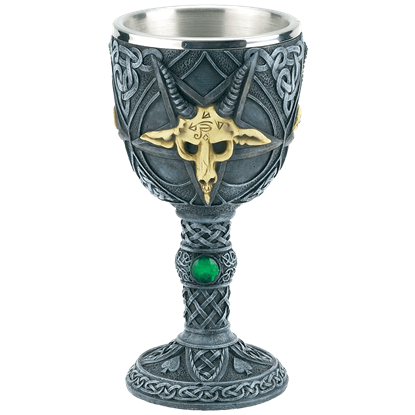 Our chalices feature fine details and depict many different styles of designs, ranging from iconic witch imagery to the Triple Goddess, skulls, dragons, and pentagrams. Each one makes for a fine accent to have sitting on your table as well as a unique addition to your ritual altar. No matter what you use them for, though, these Wiccan chalices will surely serve you well, and they will also attract a bit of interest and intrigue from all those that see it in use. The image of Baphomet has been associated with demonic practices since the medieval period, making its way today into several pagan and occult traditions. 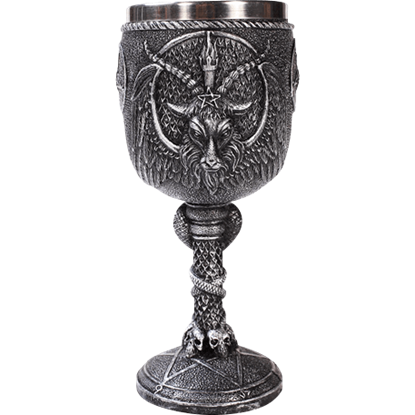 This Baphomet Chalice makes a great prop, display item, or drinking glass. The triple goddess comes up in a variety of myths and legends and in modern paganism and Wicca, making this Maiden, Mother and Crone Chalice a versatile accessory that will fit nicely into a variety of collections. 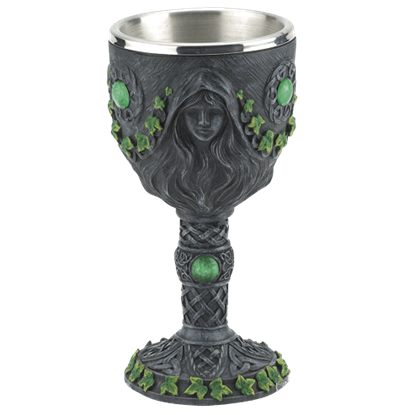 This magnificent Mother Maiden Crone Goblet has the faces of each aspect of the triple goddess in sculpted relief on the bowl, decorated with striking knotwork and lively vines and branches around the base and bowl of the goblet. The Pentagram Chalice is a great way to drink in style. This chalice would look great if used as an attractive decoration around any or room. Even better, the addition of an inset makes this a great drinking vessel, too. Just like every good witch needs a broom and a cauldron, she will also need a good chalice. They are great for spells and sacrifices. The Witch Chalice will fulfill most, if not all, of your witching needs.